These goat hair mats seem to have a long history of production, and pieces similar to this are of recent manufacture. They are believed to originate on the Horn of Africa; Somalia and/or Ethiopia are the primary suspects. 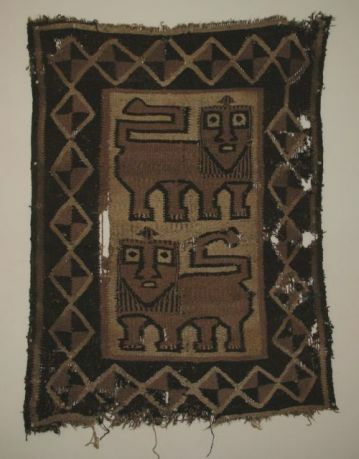 This particular incarnation is reputed to turn up in Afghanistan, and examples such as this occasionally surface in the carpet trade. They are said to be as if peas from a pod, and demonstrate the same distinctive characteristics, such as this bold border, the treatment of the bob at the ends of the tails, the squat proportions of the lower feline, the crest and brow ridge, treatment of the mane, and a distinctive look of apprehension. These characteristics render the piece unmistakable and striking. Once seen, you will never forget it.